Fantastic Holiday Card Ideas | Breezy Mama Breezy Mama - Expert parenting advice, celebrity interviews, product reviews for kids, moms and babies and more! Tis the season! One of my favorite parts about the holidays is walking down my long driveway to the mailbox with the kids to find out what has arrived today! 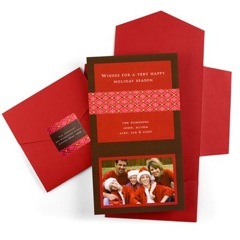 Receiving cards from friends and relatives is like a mini-gift for our family with each one that’s delivered. Of course getting it together each year to send my own always adds that little bit of stress, so Breezy Mama compiled a list of ideas to help you get a head start. The pop-out star card above is a favorite! I instantly picture my own li’l twinklers in the photo. Even better — if you order 96 or more, the pricing gets down to $0.91 each! If that still scares you, skip the next two options for cheaper alternatives. Or…pssst… for you crafty types, consider ordering one and re-creating your own version! To order ($27.99 for 24), click here. Talk about an early stocking stuffer! 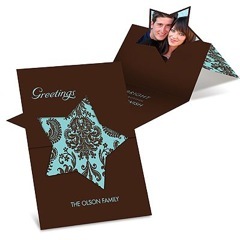 This card is so adorable with a peek-a-boo photo present inside. To order ($27.99 for 24), click here. If you send a lot of cards, you tend to get a lot of cards! For those lucky types who run out of room to display them, this card is great as it doubles as an ornament! Even if you don’t get a tree, this can easily hang anywhere. To order ($27.99 for 24), click here. Admittedly, this starts to get on the pricey side, BUT it comes with return address labels, too. The design really does give that unwrapping of a gift feel! To order ($64.99 for 24), click here. To get costs down, consider just the flat photo card either from Shutterfly, Kodak Gallery, or any other favorite photos site you use. 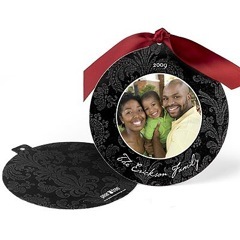 Pear Tree offers them as well, with plenty of great designs to choose from, starting at $19.99 for 24! Click here to see what they’ve got. And if you want to go ‘ol school –as in no photo — check out the hand painted card created by Designs by Lenila. 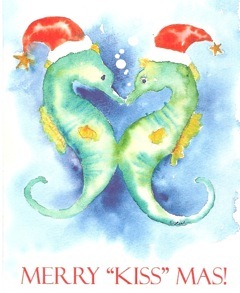 Including, well, yes, the Seahorse version. To learn more, click here. To make life easier and not have to hand write your address several times, check out the cost effective return address labels from Vista Print. The designs are cute and $1.99 for 140 (!!!! ), you can’t go wrong! Click here to get started. Want to add an extra special touch? Upload a photo to photostamps.com to create personalized postage that’s sure to warm the recipient’s heart! Click here to get started. Breezy Note! Send us YOUR holiday card after you have it ready. Either mail it to us or scan it in and email it. We want to include a holiday card photo gallery of all the Breezy Mamas! Your kids play hard. And the tar, sap, ballpoint pen, temporary tattoos and more can be even harder to get off. Check out Removeez with Aloe and Calendula and created by parents! Click here. Want a little gift to arrive in your email in-box every day? Subscribe to Breezy Mama — it’s free! Click here!